WHAT DO YOU THINK… VEST OR NO VEST? After researching a little more, I found that there are even more instances where “shaming” is used as punishment for certain behaviors. Is this a true deterrent for illegal or harmful behavior? Proponents of judicial shaming feel that simply paying a fine is trivial in comparison to the embarrassment and humiliation of a “shaming sentence”. When paying a fine, the guilt is quickly removed but the humiliation punishment forces the offender to face the seriousness of the bad behavior. While on the other hand, opponents to the shaming sentences feel that this perhaps falls into the category of “cruel and unusual punishment”. Hmmmm? I am a fence sitter on this one. I see both sides. I would love to hear what you think on this issue. Shaming. Who does it benefit? Probably not the people who are being shamed! I doubt it’s a deterrent! Does it then serve to satisfy a segment of the public who feels a need to have a sort or justice/revenge/satisfaction because of possible negative consequences? If it hasn’t proven to be a deterrent, then why keep doing it? Yes to public service, no to vests! This is a tough one. I would imagine thst anyone who has lost a loved one or been impacted in any way by a drunk driver would say they are getting off easy having to wear the vest. On the other hand I doubt it will in and of itself do anything to change the behavior. I say let them quietly clean up the trash and shame them by having them listen to panels of people whose loved ones were killed or maimed by drunk drivers, maybe that might compel them to seek help for their addiction and/or rethink drinking and driving in the future. Very compassionate and balanced thoughts Kim! 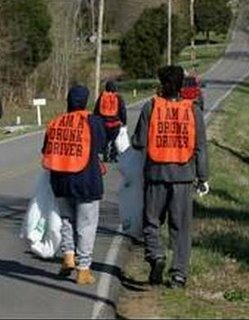 I agree as well that wearing the vest in and of itself would not change the pattern of behavior of drinking and driving. I agree with Suze on this that treatment for the drinking is probably the most effective way to deal with the problem. Thanks so much for your comment. This is an interesting topic. I’m not sure how effective this particular method would be, but I do agree some form of punishment should be given. I am against drunken driving, but I am also against public shaming, for any reason. In my opinion, it’s a rather disturbing trend. Good post, by the way! Thanks, Ann. It is a disturbing trend and I just couldn’t get on board with the shaming part. It was enlightening to see that most people, (especially those on my Facebook page) were opposed to it. I do believe that you should be punished… i also believe you should be ashamed… but feeling ashamed and being shamed might be two different things…. How do you make someone ashamed of their behavior?… and desire change… I really have no idea.. I really like that…”feeling ashamed” and “being shamed” are 2 different things. The “feeling” has to come from within, right? Just because one is “shamed” does not necessarily make them “feel” ashamed. The solution would seem to have to be a change from within the individual, hence a good treatment plan. Thanks so much for the insight! I am a retired ADC (alcohol/drug counselor) and in my opinion this will do absolutely nothing to serve as a deterrent. What it will do is shame the alcoholic drivers into drinking more in an attempt to get rid of the shame. This will more than likely result in more suicides, more drunk driving, more vehicular homicides. Not a good thing IMO. I just finished reading the law and noticed there is no component for treatment which I believe you mentioned. Treatment is absolutely necessary if one wants to reduce the number of alcohol and drug related drunk driving incidents..not to mention lowering Domestic Violence incidents. Treatment really does work. It is far less expensive than locking people up, it reduces the likelihood of recidivism. It gets people sober long term. Shaming people does not. Thanks Suze, for your comments. That’s what I wanted to hear-others opinions on the subject. Your background in ADC really is important because you have experience dealing with this issue of alcohol and drug abuse. Thanks so much for sharing your opinion.